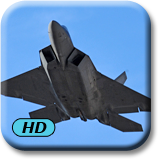 Exciting Aircraft Photos with our Wallpaper app in the Nook Marketplace! Military Aircraft in action! 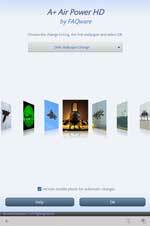 Choose your favorite from over 30 US military aircraft photos. 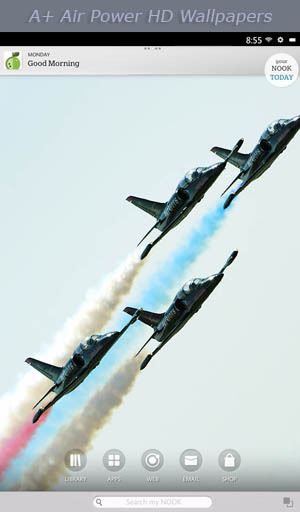 Select from fighter jets, stealth jets, war-birds, helicopters and more. Each high quality photo is selected and optimized specifically for your device Color/Tablet/HD/HD+. Our A+ apps consistently receive top ratings. These make awesome lock screens and revolving wallpapers with full captions that appear as you scroll through them. Photos change automatically each week, day, hour, minute, or stay on a single photo. Change photos any time with a swipe up or down! Have fun personalizing your device home and lock screens. Check out our other popular apps, such as "A+ Armed Forces Gunning for Action" too!